Use up to three cameras and/or accessories at one time with Slik's Twin Pan Camera Platform. It mounts to any tripod legset with a 1/4"-20 threaded post (this has a 1/4"-20 hole, not a 3/8"-16 hole), and has two panheads which allow photographs to be taken independently at any angle as well as a third 1/4"-20 on one side which you could use to mount a small tripod head or another camera. 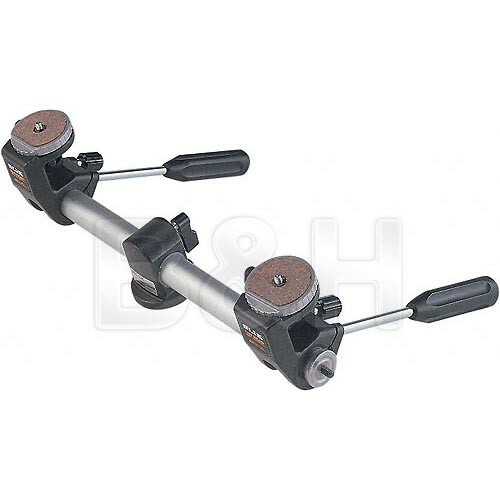 You can remove one of the pan heads to use this device as a lateral side arm, and in that regard it has a maximum lateral displacement of ~13.8" (35 cm). Twin Pan Camera Platform is rated 5.0 out of 5 by 3. Rated 5 out of 5 by Anonymous from Excellent Very strong and heavy rigid construction. Spring loaded easyscrew makes it very easy to attach camera. Can rotate camerahorizontal flawlessly. Can rotate vertical but need toloosen the screw, that is only a few seconds task. Verylarge circular plate form for camera. Can shift camera alongbar. Rated 5 out of 5 by GhostBreakers from Used for Paranormal Research I am a Paranromal researcher and have adapted several of these to an idea that helps us in our research. They are easy to use and configure to your own specifics to enhance your photos. Great product, high quality and I am passing it around.